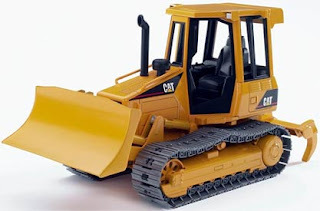 Another cool gift The Monkey received was this Caterpillar Bulldozer by Bruder. The monkey likes to go over to the park and make mountains, big and small. He won't let us throw the box away because it's the garage for the bulldozer. He likes to recycle. Oh my! My son loves playing with big equipment like that! We have my husband's toys from when he was a little boy...tonka and stuff. Lasts forever.